Molly Huddle broke the American record for the half marathon by clocking 1:07:25 over 13.1 miles at the 2018 Aramco Houston Half Marathon on Sunday. The 33-year-old had previously run 1:07:41 in 2016, the second-fastest mark in U.S. history behind Deena Kastor, whose 1:07:34 has stood as the standard for American women since 2006. Huddle's en route splits unofficially broke the U.S. records for 10 miles and 20K in 50:52 and 1:03:48, respectively. 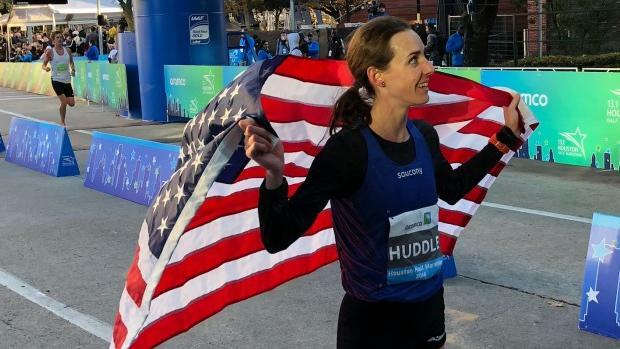 The pre-race hype surrounding the event focused on a showdown between Huddle, a two-time Olympian who holds the American record for 10K, and 26-year-old Jordan Hasay, a former high school track phenom who turned out to be a precocious marathon talent in her debut last year. But in pre-meet interviews, a difference in countenance emerged between the two athletes as Huddle seemed keen on breaking the record, just seven seconds faster than her best, while Hasay regarded the half as simply a tune-up for her big goal this spring, the Boston Marathon in April, where Huddle will also compete. So from the start, Huddle put herself in the main pack while Hasay hung back and ran her own race, ultimately finishing eighth --one place behind Huddle's seventh-place finish-- with a time of 68:34, two seconds faster than her run here last year and 43 seconds off her best time from Prague. At 5K, the first recorded split for the women's race, Edith Chelimo led the field in 15:48 with Huddle in tow at 66:40 pace. Hasay ran about 11 seconds behind in 15:59 and that space between America's top two athletes would hold throughout the race. Huddle managed to stay with the main pack through 10K in 31:34 (66:35 pace) and 15K in 47:29 (66:47 pace). She passed through 10 miles with the pack in about 50:52 (an unofficial U.S. record) but said she started to fall off pace after that. At 20K (about 12.4 miles), she was 36 seconds behind leader Ruti Aga of Ethiopia in 63:48. With just over half a mile left in the race, Huddle was able to gut it out solo for a new record. "I fell off the pack at 10 miles and I was looking at my splits and knew it would be close," Huddle said after the race. "I just tried to kick it in." The men's race was nearly as exciting, as New Zealand's Jake Robertson gapped Ethiopia's Guye Adola, Eliud Kipchoge's surprise challenger in Berlin last fall, for the win in 1:00:01, one second off his best after Adola and Kenya's Alex Korio set pace for much of the way. Adola, whose Berlin run marked the fastest debut marathon in world history in 2:03:46, placed second in 1:00:15. Olympic silver medalist Feyisa Lelisa of Ethiopia took third in 1:00:20. Americans Sam Chelanga and Haron Lagat kept pace with the front pack for nearly the entire race and both finished within the top ten. Chelanga, in sixth, now ranks No. 3 all-time in U.S. history with his mark of 1:00:37, and Lagat, in tenth, ranks No. 6 all-time with his 1:01:01. In the early miles, 43-year-old Bernard Lagat was on pace to break Haile Gebreselassie's master's world record of 1:01:09. He slowed slightly to a still very impressive 1:02:00 finish time in 15th place, between Diego Estrada and Jared Ward, in what is a U.S. master's record and No. 2 all-time in world history. In the full marathon, Ethiopia's Bazu Worku recorded his third win in Houston with a time of 2:08:30. Wilkerson Given was the top American in sixth place with a time of 2:15:52. The women's marathon saw an Ethiopian sweep led by Biruktayit Degefa in 2:24:51.